Williams is a well known British sculptor. In the 1970s he was working in an abstract style, although still with reference to real objects. His work later became much more figurative. 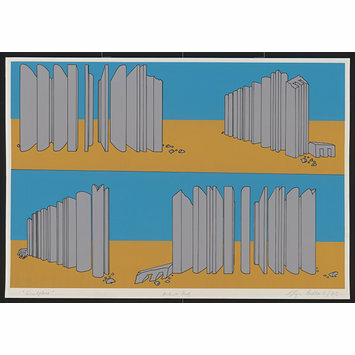 This print relates quite closely to pieces in wood he was making in the early 1970s which took the form of crates and similar constructions. In some of these pieces Williams seems to be working with a cross-over from two to three dimensions, using the idea of a shadow as a solid part of the sculpture which at the same time remains flat. 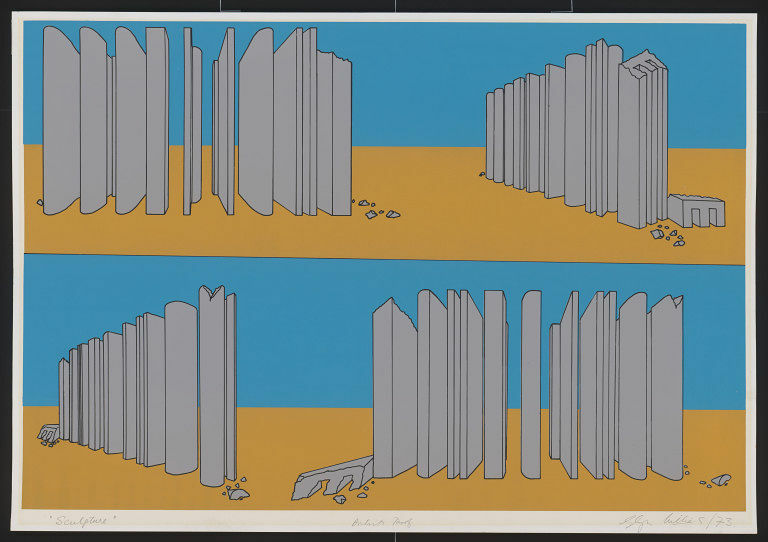 In this print the 'sculpture' only reveals itself to be carved, three-dimensional representations of the letters forming the word SCULPTURE through the fallen letters at the ends of each stand of columns. This suggests a playful approach to questions of spatial relationships in both two- and three-dimensional work.